Aiming to find pretty scenes and interesting skies each week for Sky Watch Friday sure is good fun, you never know what you might find. Check the link to see 100s of other views of the sky from all over the world. 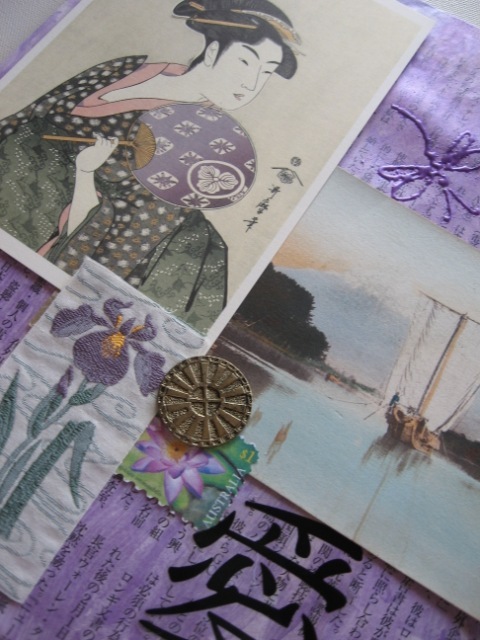 Murasaki is part of a travel themed altered book I am working on. And exciting news about the All About Paper event on May 17 a day full of fun with pretty printed papers on cards, invitations, and altered items. Can’t wait now to share the fun. Thank you for everyone who wrote to ask about the paper placemats. On this occasion I went a little tone on tone, but you can find these pretty printed papers in all kinds of colour schemes and every theme you can imagine for as little as 50 cents each at a local scrapbook store. Lovely clouds…, feels like a summer day in the quiet country side. This is a lovely shot. You always accompany sky watch photos with such wonderful quotes. Interesting to know why the posts are of different heights? I love this photo. The fence posts (and their shadows) are wonderful. And I love how green the grass is. Oh yes! The sky is nice, too! Always loved C.S. The words work well with your photo. Beautiful, peaceful shot. LIke the composition with the fence line running through. This is the kind of place me and my camera adore, green and gorgeous. this is a beautiful capture…so like it.have a wonderful weekend. 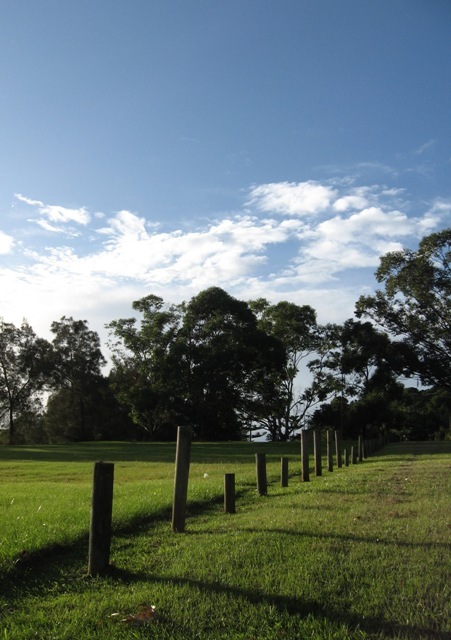 pastures, blue skies and white puffy clouds…it makes me want to lay in the grass and read a good book! Lovely photo..I sure have been aiming at the clouds lately! I agree with you that it’s fun always being on the lookout for a good skywatch shot. Love yours! The sky looking peaceful in this farm scenery. Thanks for visiting my blog. Your kind comment is much appreciated. Pearl: What a neat photo down the fence line. I don’t ever think I’ve seen such an uneven fence before. Farmers always seem to keep the poles a certain length. Beautiful skywatch photos, just stunning! Just beautiful, I love seeing your skies! We might be separated by lots of ocean, but we share the same sky! wow!!! that is a beautiful photo! Loving the book you’re working on, can’t wait to see more! Beautiful photographs! 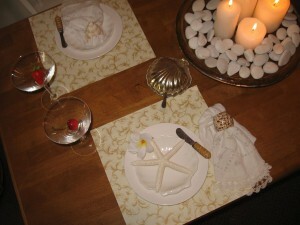 I love the idea of using scrapbook paper for placemats, I never would have thought of that.